Roslyn lived in Cottingham, Anlaby then Cottingham East Yorkshire until 18. Social injustice had an effect on her from being a teenager. Christianity was a strong influence from her wider family. “I decided I wanted to be a Social Worker to help change the world into a better place to live. In those days (1968), you had to be 21 to start training as a Social Worker. So, in 1969 at age 18 I became an Executive Officer (Short Term Benefits Supervisor) in the DHSS (Department of Health and Social Security) in Kensington London. I thought, at the time, that that was the next best thing to do, until I could do the Social work training! I also took part in anti-racist demonstrations and other political happenings to demonstrate against injustice etc. I loved the Youth and Community Work course. Theory and practice with lots of reflection, discussion and social life. I did placements in Salford, Wythenshawe, Shelter Housing Aid Centre London and Liverpool. I have lots of stories from those placements and the work carried out. I was asked to publish some of my work. Regrettably, I didn’t! These stories are for another day. This story is more about Hull and East Riding. After the course at Manchester Polytechnic I got accepted to live and work as a volunteer in the Longsight district of Manchester. (1974-76). Longsight neighbourhood also held a community of individuals in differing houses sharing common aims of improving communities, practising non-violence. I was taken on as a community activist. Amongst the houses, we shared facilities like washing machines, regularly ate together, had spontaneous music sessions and did various community activities e.g. clearing vegetables from the market stall at the end of the day and distributing them; squatting a few houses in the nearly demolished houses (it was in an area to be regenerated|). The squatted houses became an advice and community centre, children’s play house and further accommodation. We shared our rents and mortgages (DITTO Drop in the Ocean) and some went on to develop a housing co-op. There were lots more activities including a community news sheet which was quite political. The Hamilton Road Neighbourhood Centre we started then is still open today! (2018). These are other stories to tell another day! 1976–1978 After this there were various travels to other countries, living alternatively in London, differing, temporary part time jobs in Manchester and then London. Involvement in residents’ groups in Todmorden, Lancs where I lived for a year plus factory and other temporary work plus being a Women’s centre Co-Ordinator in Paddington London. 1978–1984 Having met my partner on the road, literally, I moved up to Scotland and after a temporary job with BP in Paisley, worked at Scottish Special Housing Association based in Glasgow. Firstly, as a Housing Officer, then team leader and for a few years as Community Development Officer in part of Glasgow and west of Scotland. There are many stories from this time, but I also helped develop one of the first tenant management co-operatives in Glasgow and Scotland. The residents designed some aspects of the build too. Community development, community education was very active in Scotland. There were many campaigning groups, political action as well as active community/resident groups and support. The local authorities provided workers in the community education centres, which thrived in various communities and Scottish Special Housing Association (SSHA) were keen for community flats and resident led organisations. These were Thatcher years. Although community development posts lessened there was an interest in community development e.g. The Chair of SSHA (Conservative Government appointed), spoke very highly of our community development work. When I returned to Hull at the age of 33, having left at 18, I was surprised at the lack of community/ voluntary organisations and community development work/support in the area. There seemed to be so much going on in Scotland, especially Glasgow and Edinburgh, including pioneering work around housing. I expected Hull to have a similar set up to Scotland such as community education workers. Also, there was a boldness about some Scots. Possibly due to the high level of Trade Unionism, radical Dockers, activists etc.. In comparison, Hull seemed meeker and milder. However, I soon learnt in my first job, that there were people in Hull who were fighters of justice; for their work, their families and their communities! Also, people really wanted to develop much needed community facilities in their neighbourhoods and network well with each other. They were passionate for change! The following is taken from a piece written by Roslyn for Hull Federation of Community Organisation’s 20th Anniversary in 2002. This epitomises the community work carried out in Community Associations. “Returning to Hull in 1985 after working away for many years, I thought that the whole of the population had come to interview me when surrounded by the whole HFCO Committee at my interview! (About 12 people). This beginning just highlighted the commitment, enthusiasm, dedication, vision, and perseverance of volunteers and community activists who managed and ran community organisations at that time. Many groups and neighbourhoods did not have Community Centres, but they worked away building up their organisations, meeting the needs of their communities, campaigning for premises. Many of them did this on top of jobs or family and home commitments. This was the pioneering spirit of Hull. It existed then as it does now. You couldn’t relinquish that fighting spirit then, and never will do despite adverse conditions. 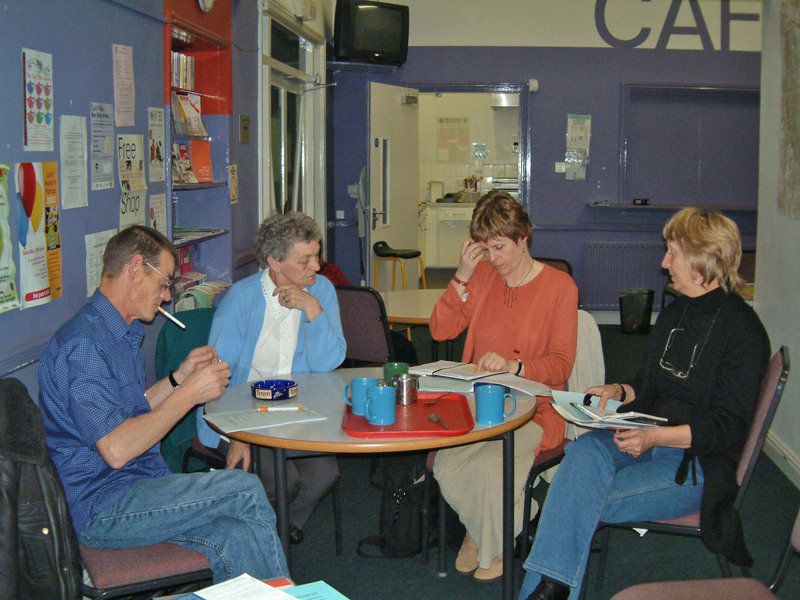 For example, people and groups campaigned for community centres. Bilton Grange were told by the local authority ‘to prove’ themselves over five years and then they would be considered for a Centre. For five long years a small group of local volunteers ran community activities in a four-bedroomed house. When they ran out of room, they hired other venues for activities. When they needed to raise funds, the friendship of other HFCO members came into play to help them. South Bransholme Community Centre used to lend their centre free of charge so that the group could hold fund raising events. That’s the level of support that constantly shined through between groups of the HFCO. Needless to say, Bilton Grange did prove their case and were rewarded with a spanking new Community Centre. What a proud event that opening was: food galore, John Prescott MP to open with Councillor Woodford present. That was a day to remember. When asked, how come the volunteers could prepare so much food, I was informed “Oh, it’s easy, you multiply the food a few times more than you would have done at home. “The table was bursting. That volunteer is now a councillor in the area Betty Hewitt. I remember that the HFCO and its member groups were way ahead of their time. Supported by Kevin Curley (CVS), Andrew Gillespie (Hull City Council) and many others, the HFCO led by Doug Revell and then Liz Shepherd went into partnership with the City Council and the Community Centre Development Strategy was born in the 1980s. Partnerships, old hat now, were new vogue for the 80s and the HFCO and the City Council paved the way with their Community Association Liaison Committee which was the only group in the Community and Voluntary Sector to have their own committee with the City Council (Leisure Services). Pioneering, eh?! Policies were fought, successes relayed, issues aired, centres, groups and community needs were brought to this committee. These were the days when black and ethnic minority groups were getting established in the city and for several years community groups worked to ensure neighbourhood communities and black/ethnic minority groups were able to have their own meeting places, a focus for community life in neighbourhoods and across the city. The HFCO were ahead of their time. Looking through some old Annual reports, there are stories of many of the activities, events and issues that the HFCO were involved in. One Summer, it looked as if monies for play schemes would be cut or lost in Hull. (Many community centres held play schemes in the 80s and early 90s). That fighting spirit, the commitment to the communities uppermost in their minds, saw men, women, and children from community centres and communities in a hired minibus departing to Leeds to lobby the Government Office. Needless to say, the play scheme money was not cut!!! " (Sue Alvis and Hull Community Play schemes were instrumental in getting this campaign organised). And so on. The above list is just a few of the activities and issues tackled. During my time at the HFCO I converted my Youth and Community Work qualification into a BA in Social and Professional Studies degree in 1993-1994 at Humberside University over one year. I worked one day a week for nearly an academic year and Dave Walker was employed to cover my other days. I also completed Community Matters (National Federation of Community Organisations) Licensed Consultants’ course and went on to do the CCETSW (Central Council for the Education and Training of Social workers) Practice Teaching course for Social workers. This qualified me to supervise social work students on community work placements. The Licensed Consultants’ course made me more qualified to advise community groups, especially voluntary management committees managing buildings, activities and their own organisation. I had social work students a few times in HFCO and in future jobs. I also got involved in the Humberside University Youth and Community Work course, assessing practice placements and delivering an Assessing Communities module. I also did some equalities work on the Social work course and delivered lectures there and at Hull University. Roslyn was keen to ensure that the values and practice of community development, of building community and individual capacity to be active citizens in their community, was developed. Plus, any injustices addressed. Whilst some rules and regulations can dominate the real work going on, Roslyn also believed that working within guidelines, certain radical legislation , structures to guard and safeguard people, to help them be inclusive, gain a voice, enjoy their time together etc, was important. Sometimes the guidelines and structure seemed to restrict development but managing a building and reaching out to the local community were important facets of community associations. Volunteers had a lot to learn and do but it helped them, in those days become more skilled, confident, social, political and welcoming. In HFCO, the work with the subcommittee of the City Council Leisure Services (Community Association Liaison Committee or CALC as it was known by), influenced community centre , community association development policy, including that of the black and ethnic community. The black and ethnic community groups at that time(1980s) had a long journey to persuade the City Council and other organisations to help them find separate premises from the generic community centres. In the early 1980s, the City Councillors, didn’t, at that time understand the need for separate facilities or why they couldn’t join together in one building. The City Council gradually learnt more about the needs of Black and Ethnic groups as well as those of people with disabilities (equalities and diversity) through local group pressure and legislation such as Race Relations Acts and began to support the groups gain their own premises. Some of these groups like the Afro Caribbean Association and Chinese Cultural association were part of the HFCO for a time. Then the CRE (Commission for Race Equality) supported by Hull City Council and Humberside County Council, tried to help. The CRE only lasted a few years. As peoples’ stories show, these groups had a long fight and great tenacity in obtaining their own buildings, often with fund raising efforts and some help from the Council and other organisations. Racism and lack of understanding was challenged. Councillor Woodford, Chair of the CALC could, at times be critical when dealing with the HFCO reps (who were elected annually). However, he once closed South Bransholme for an incident, but when he went down to have a look at what the volunteers did and who benefited, he came back full of admiration for all centres and the untiring work the volunteers undertook for their communities. From then on, he was a friend of community associations, especially South Bransholme Community Centre whose work in and for the community he grew to admire greatly! Kevin Curley, Hull CVS (Council for Voluntary service) was instrumental in setting up the HFCO. Andrew Gillespie and his community officers at Hull City Council created and developed the community centre policy, management of it and support to the associations/buildings. HFCO was the umbrella body of the community associations. The community centre strategy meant that several areas of Hull were designated for a centre. A ‘model’ new centre was designed for some areas. In others, old buildings were used like the old de-contamination centre in Preston Road which was still being used in 2017. The City Council provided half running costs plus a cleaner and community officer support. Dangers of partnership working- Don’t get too friendly with those in power! The HFCO always objected to and fought against decisions that did not benefit their members and so the City Council came to expect full representation of issues from the elected representatives. However, partnerships often mean that when the ‘underdog’ has its feet under the table, it starts to be ‘pally’ with its more powerful partners, accepts what they say and do and in fact, become like them, but without the power. This is a danger of some partnerships. You can never trust those in power or with the money, no matter how friendly or forthcoming they are. Always keep your independence! Several times, over the years in the partnership/representation at the Community Associations Liaison Committe HFCO members won their argument over several issues including funding, equalities, leases etc. Until one day when the City Council proposed to cut the Council’s paid Community Officers who supported community centre development. It was expected that the HFCO would fight this, but they didn’t. This, in my mind was the start of the HFCO losing credibility with the Council. HFCO always had an edge, a power as it had thousands of people behind it in the communities. A couple of times the HFCO budget was saved through campaigning, putting across good arguments, facts and information in representing the issues. Council staff were cut. After that a Councillor recommendation ensured that Hull CVS and the HFCO lost a lot of its core grant, because of a personal issue, meaning that CVS Director (then Dave Burnby) and myself at HFCO had to be made redundant. The small amount of money given to the HFCO meant they could only employ an administrator, which meant no development work. Community Matters at the time suggested that the HFCO go for a one day a week development worker rather than a ‘more’ hours administrator, as there was more to be had by development work, albeit limited. At this time there were several voluntary managed community centres in the city servicing thousands of people in their communities. HFCO as I write in 2017 is being wound up now. There are no community officers employed by the City Council, little support from the Council. Community Matters is no more, Hull CVS is more like a training/trading organisation. According to some of my interviewees for this project, they feel that community centres are not being run as they should be and thereby providing a limited service for the community. The model of a community association and its community centres, if adhered to, is an empowering and inclusive way of community developing communities, community hub, providing activities, resources and a local voice. The voice is now lost as the HFCO folds and community centres become little more than buildings to be hired out. Lonsdale Community Centre seems to be the exception, I am sure there may be others too. Lonsdale has developed enterprises like its community shop and café and has daily/evening activities. It has some paid staff and volunteers and runs educational/training schemes for the local population. Earlier on, as I was working for the HFCO, in 1986/7, some communities, community groups trying to develop and looking for facilities would ring up HFCO and complain about some of the local Churches’ negative attitudes! In some areas, e.g. Preston Road, churches seemed to resent the local community hiring out rooms for community activities. It was a tricky one, for as a Christian I believed this was a strange attitude to have. Then, after a couple of years, vicars started phoning me up for advice about community groups constitutions and community groups development. In addition, Andy Dorton then started a Christian Community Workers group which I attended along with a couple of other Christians working in the community. One was John Girtchen, a City Council Community Officer with community centres. We were able to explore our community work together, see how the Bible talked about and worked with community. For me it was an eye opener. As a fairly new Christian, I felt a great divide between Church life and that in the community. I had always thought community work was my vocation and my Ministry, but the Church seemed to want my help in developing the Church. To me a rounded Christian faith has faith in action, loving/helping people where they are at as well as the teaching, encouraging to live in a social-cooperative, caring way. God has ordered life well if we follow it. The Christian values were also shared by many other non- Christians or of other faiths e.g. equality, diversity, sharing, caring, respecting etc. As these were shared, other community workers who shared our values asked to join the Christian Community Workers group. So, we became bigger and discussed Community work in the city, believing that it needed to be co-ordinated. Rev. Dave Rogers, Chair of CVS was also a part of this group. Others included Ian Holmes, Sheila Jones, Liz Shepherd. At the same time, a social group, sub group of Cityvision, chaired by Dave Burnby (then CVS Exec) argued that before more capital money was spent in the city on physical regeneration (money being bid for after a previous failed bid), that disadvantaged communities needed to be developed and engaged with first. (See David’s story). Around this time, as I had been made redundant from HFCO 1995-96, I worked under David Burnby at Hull CVS as a community development worker. One area was Thornton estate and another Gipsyville. Two of the areas that would benefit from funding should the City Council’s bid be accepted. (SRB- Single Regeneration Budget). This included community development monies. Thornton estate’s Goodwin Development Centre wanted their own monies to develop a media centre, I think, and other business type activities. They were not keen on CVS (Council for Voluntary Service).. (One of the Councillor’s was the one responsible for ensuring Council grants to CVS and HFCO were cut). It was difficult getting a foot into Thornton estate because of this! So, more time was spent in Gipsyville at a Community house that encouraged local community activity and enterprise. I supported, I remember two or three mums to start running a playgroup in the house and there was a sort of community led job shop (Christine Ebelthoft now at NHS). There was work with the residents and it was the fore runner to the Community Resource Centre that is currently still in Gipsyville. ( an economic resource to help residents gain confidence and skills to get jobs). At this time, Gispysville residents wanted regeneration of its housing stock. The Councillor with the Housing portfolio suddenly announced that the Government would provide monies for regeneration in the area but only at the expense of demolishing some houses (with some new houses being built). This split the estate. Some thought this was great, whatever the cost, others were devastated as they would lose their home and weren’t guaranteed a house in Gipsyville when their house was demolished. Gipsyville was then, a place generally with strong family ties. This was a real blow to the community as it divided opinion and friends/family. Allegedly the Council said that there had been little room for consultation with residents and that this was the best thing for the estate. At this time, sometimes it was alleged, that Government monies did not allow time for resident consultation, often tying Councils hands as to how and where they spent much needed housing regeneration monies. Part of Community Development, part of participatory democracy is at the very least need for information, even consultation on issues that concern local people. (Community engagement). A Councillor and Council took decisions on behalf of the community without consulting or working with the residents to develop the best solutions for the area. To cut a long story short, I helped some of the residents to form a group called Gipsyville First which tried to fight the demolition plan and ask for more consultation. I asked Andy Dorton (Church of England Social Responsibility Officer) to get involved, which he did plus people from the Community Church who lived in the area and were actively involved with its residents. So, there were two factions, for and against demolition and there was great animosity between the two sets of active residents. It led to angry words on the street and on door steps. I was sent to Coventry by some of the people working/volunteering in the Community House and I was even kind of warned off by Council staff saying the Council Portfolio member was not to be crossed! Hull City Council, at the bidding meeting for the regeneration community development monies did not seem interested in obtaining the money. Their officers felt that they had enough on with managing and supporting leisure facilities and community centres! So, DOC, which was formally constituted, won the money! The decision to award Hull Developing Our Communities (DOC) the £1 Million for community development work in emerging areas for regeneration, was very unpopular with several City Councillors, who politically tried many ways to investigate us (e.g. External evaluation), observe us and try to trip us up or just were plain ignorant of us and not allowing us to work in some areas e.g. Gipsyville. Plus, the Goodwin Centre did not want DOC working in the Thornton area. They wanted their own community development money. Their bid for a media centre etc had failed. Some councillors and officers were positively rude and dismissive of us. My colleagues and I each had an area in which to carry out community development with local people and organisations. I had been given Thornton estate to work with, knowing that this would be difficult, because of Goodwin opposition. Despite being based in the area, supporting community groups/new work, credit unions etc, residents were told by Goodwin not to work with us. Working on Thornton estate became more and more difficult. At local Community Forum meetings, the local Councillor would mock us (the same one who had withdrawn funding from CVS and HFCO), the residents would ‘boo’ as they had been told we were no good. Despite this, myself and a Social work student still managed to do community activities with residents including a resident group formation and credit union working group. I kept advising the DOC board, however, that we should withdraw from the estate for a while and get into discussion with the Goodwin centre about the best way forward. The Goodwin Centre still insisted that the money for the worker should go to them. (It was allegedly a resident led board). Stress, More conflict and Participatory Appraisal – Solution at last! The pressure caused extreme stress and I was ill for two months. Before this happened, I had been working with a Shaun Horton from Housemartin Housing Association on drawing up a Participatory Appraisal Project for the Thornton estate. The Housing Association were to fund the project. (Shaun is currently an East Riding of Yorkshire Councillor). This would have two of the trainers from Hull University doing the research and training (Martin and Ingrid) with residents led by a steering group which I would set up with Goodwin and others. All the DOC workers had been trained in Participatory Appraisal and continued to work and train up residents and community groups in each of our areas. It was so that local people took the control over the processes of deciding what they wanted to do in the area and how they could prioritise and solve problems alone, together and with others. Or just plain influence the outcomes! Whilst I was off work, I tried though my Union to make a case against DOC for getting me to continue to work in the area, knowing that I had suggested withdrawal to have talk with Goodwin etc. (DOC felt that as I was making headway with some community work despite the nastiness of the situation, that I should continue.). At the same time, because the City Council were trying to discredit DOC, or so it seemed, a prestigious external evaluation firm were sent in to evaluate our work (after only one plus years). They came to the conclusion that DOC was doing good effective work. However, they advised that I should be withdrawn from the Thornton estate until such time that discussions with Goodwin were held about future work, as I had already suggested! When I returned, DOC was awarded the monies for the Participatory Appraisal project on Thornton estate working through Goodwin Centre and the Council run Area Forums. Putting the proposal to both these arenas went well despite the heckles and so a Quality of Life steering group was formed. The rest is history. There was a Quality of Life part two and still in 2017 a Quality of Life Manager. The director, Peter McGurn worked with residents and his Board on the results and started making things happen on the estate that came out of their proposals in the Quality of Life Participatory Appraisal project e.g. play area, better GP facilities. It became a way of working for Peter and Goodwin and is written up in a book after 20 years of working on the estate. Since then Goodwin has become a Development Trust and gone from strength to strength in not only local community development, new facilities e.g. Octagon centre, housing, but also managing and working community projects in the rest of the city. (Including community wardens at one point). This hasn’t always made them popular as one of the Big players, but they have kept going and believe that they are still community led. Gill Hughes and David Burnby have written about the Goodwin Centre in their stories, but we must never forget that DOC was instrumental in facilitating Quality of Life participatory appraisal in the Thornton estate. That is the power of community development and the people, local organisations often take the credit, they forget the hard work going on in the background, facilitating empowerment, developing community led solutions from difficult beginnings. In Bransholme, I worked for a while based in a local school (Biggin Hill). A performing arts school was extended into the school so that local children could have a go at dancing etc. Nowadays a lot more of this type of activity is happening in and around schools and communities. . Gina Holdsworth, mentioned in other stories, sometimes did participatory appraisal sessions or helped with pamper days in the school community room where I was based. Gina worked for DOC at the time. DOC’s cultural /sports targets reached in one day! DOC had lots of SRB (Single Regeneration Budget) targets to fulfil and one was a cultural one. 75,000 people to experience a cultural event. So, we held a massive Celebrating Communities event in Princes Quay where many groups put on dancing, and other activities/performances and stalls including black/ethnic groups. (I organised with another worker). Another big target was around sports, so despite not being able to work in Gipsyville, I organised with the people and groups I knew, a sports day in the area. This was also highly successful and popular and well attended, many young people going on to do further sports. After that, DOC was not allowed to work in Gipsyville! There are many more stories to be told of the people and places but then I got another post within DOC…. From 1998-2001/ I worked as SRB manager, managing the community workers within DOC. (Developing our Communities.) Loved this! Supporting, encouraging my team to work as a team and advance knowledge, practice, theory etc as they worked with local people and volunteers to improve their communities. Lots of stories could be told about how individuals were given opportunities, confidence, skills by being involved. Stories too of a few things that weren’t so successful like trying to get a building in Greatfield operational for the community. It didn’t work. DOC was getting bigger, attracting more monies, doing other types of projects. Who can forget the amazing work of the community workers and the inspiration of Mary Clear and Gina Holdsworth! I shall always remember Mary’s work in Orchard Park/North Hull to help people look up and have hope. At Christmas, angels were projected flying up and down onto a few multi storey buildings. Angel workshops made costumes and there were parades to St Michael’s Church for Christmas worship of families. Schools and families were involved and St Michael’s Youth project. We had more Participatory Appraisal projects e.g on Hessle Road and more workers and resident involvement. Were the results used? I don’t know but many people were in receipt of the reports. There were launch events and people networked and shared stories. Liz Green was one of the people doing the Hessle Road Project. Sheila Jones and Gina were involved in the Riverside one around the Mitchell Centre. Paul Spooner, DOC Manager and Susie Hay, Business/Admin worker were active and supportive in these initiatives. DOC even got involved with anti-poverty work nationally and with joint work in Northern Ireland. Training others in Participatory Appraisal, provided a further income stream and enabled DOC to empower others in community engagement/development skills. Many people got involved in DOC and more workers taken on as the years progressed including apprentice community workers. Lots of learning modules were introduced, too. Helen McGill and I managed the apprentices and their learning with Paul Spooner, and we made links with the university and other providers. So, DOC also provided employment and training for local people and volunteers. In 2001, DOC was awarded further monies for community development. The staff team were working well as a team. My job was done. Time to move on…. 2001-2002 – Community Development Foundation. I worked then for this organisation for a year. Although based in Leeds, working from home and then in an office in Hull University, but travelling widely, the work very much was about disseminating good practice amongst practitioners plus influencing the government with its findings. It was a quango government organisation, just as SSHA (Scottish Special Housing Association) was in Scotland that I worked for. Both SSHA and CDF no longer exist. In fact, local and national infrastructure organisations and providers for housing, community/voluntary organisations and their communities and for community work practitioners have deceased. There are still community development and youth work courses in the country e.g. Hull and Lancaster universities but I am not sure who is funding the community work now, possibly Churches, Lottery, local trust Funds, Church Urban Fund, developing enterprises etc. Then, contracting was introduced on a big scale(introduced, by Government) instead of grant schemes from the local authorities and other grant providers.. This became greater from 2008 onwards. Consequently, groups were competing against larger organisations for monies. My experience was that partnership and co-ordinated networks to attract money didn’t seem to work. Often dictated by funders with a hope that co-ordinating would help bring more effects, smaller groups and organisations struggled to compete in an increasingly competitive world. Many larger organisations appeared to stray from their main aims and objectives, or drive along different routes, purely to obtain money to keep going. These were my observations as I watched more and more community groups fold as funding and support ceased and bigger organisations provided less input to community groups. Many organisations appeared to follow alternative paths for funding often delving into other streams of work e.g. North Bank Forum was a health and social care organisation but started doing community groups/development work winning a contract from Hull CVS. Community development, community led initiatives seemed to be fading into a distant past…..
2002 – 2008 Hull Community Network. I changed jobs before the year was out from CDF (Community Development Foundation) to Hull Community Network. It suited my style better. At this stage I was really keen to support practitioners further, but I do like hands on work as well as the strategic stuff and policy. Neighbourhood renewal was popular now, another Government Initiative, plus engaging with communities etc to get involved with the Local Strategic Partnerships (LSPs). Here was an opportunity as Community Engagement Worker to engage with communities of all interests and place plus marginalised people to influence strategy and outcomes in the city to improve quality of life. This was participatory democracy at play and not necessarily approved by Council elected members. So, money for capacity building, community representation, neighbourhood renewal including small grants was awarded nationally. I was a community engagement worker and loved working with Diane Frances, Linda Tock, Susan Frost, Sarli Sardou, Rob Pritchard and Janice Richmond. We worked closely with DOC and put on a huge conference Whole New World with loads of follow up work around participation, building communities etc. A great’ How Your City Works’ course was developed (Diane Frances, Lyndsay Knott, Liz Shepherd, Tish Lamb) and many people went through this and some went onto the University to do degrees and further learning. The training empowered people to develop representation skills for the Community Network and for and with their local communities. Many people hadn’t studied before, but they gained more information and confidence by learning how decisions were made at all levels. One guy hadn’t been at school since he was 15 or so and been unemployed for many years. He was a little dyslexic too. He went on to gain a degree (part time) in community studies. Gill Hughes and other staff in the University were great at providing access courses like this. Unfortunately, all these types of courses have ceased. (Funding cuts). Gill’s story explains it in further detail. Sarli helped to set up HANA, Hull All Nation Alliance as his work was engagement with ethnic and black groups. This still operates, and Francis from Humber All Nations has told a little of that story. I also helped to develop a community engagement strategy for the city for the LSP (Local Strategic Partnership). The Regional Government also helped to give a bigger influence and add their existing work to it. We had learnt a lot through the housing consultations and other work we did. We supported the reps etc. Representation is hard. People elected want to give their own views, but we need to collect in, consult with people/communities which is not always easy in the time scales. The government didn’t give enough time for this all to work. 2008 - Funding cuts meant redundancy, so I went to China for three months helping church-based work teaching English as a second language in Tianjin, China. It was fantastic. I wanted to train in TESOL when I got back to England, but my mother was ill, so I needed to get work locally to keep an eye on her. Coral Gladstone, ex Hull DOC and then East Riding of Yorkshire Council Manager of neighbourhood renewal contacted me to do some work with her team. 2008-2012 – East Riding of Yorkshire Council- Neighbourhood Manager Goole, because Coral Gladstone head hunted me! Safer and Stronger Communities Funding liberated funds to work in the most disadvantaged areas of East Riding of Yorkshire which included parts of Bridlington and Goole. I was in Goole whilst funding lasted for 18 months. Temporary contract. It was quite liberating. Partnership working doing Planning for Real and Participatory Appraisal with street surgeries with other agencies such as the Police, Fire Service, NHS…. Local people would wait for the street surgery teams to arrive in the streets or make appointments if it was a sensitive matter. Hundreds of issues wee dealt with from dog poo, street lighting to anti-social behaviour. Working with councillors and other agencies led to interesting changes in our work as it was listening to residents and involving them in service delivery and future plans for their areas, albeit local problems. Reports were published, and resident contacts were maintained. Community forums were held for community/voluntary organisations helping to work together for the common good and addressing local issues. Then I became the Area Community partnership co-Ordinator for Haltemprice and Hessle and Howden and Goole areas when Safer and Stronger Community Fund monies ceased. We still practised some of the work developed in the Neighbourhood Management areas of Goole and Bridlington such as street surgeries, community forums and partnership meetings. I covered two areas as funding cuts grew and it wasn’t easy. However, I like to get stuck in, so in Keswick Gardens, Cottingham I worked with Hull City Council, local councillors and Cottingham residents in cleaning alleyways and stopping fly tipping. This brought residents together and with councillors. Plus, in Gilberdyke, where smells from tipping sites were causing problems, the encouragement for everyone to get together to come to some solution. This included the Environment Agency. Some of these agencies and firms are not challenged enough, I believe because they carry on doing their own thing despite Council and/or resident objection e.g. firms dealing with gases and waste on the site. Land refill, waste is an ongoing issue that everyone has a responsibility for…..
Maybe some partnership working works after all…….! Working for a Council was a real eye opener and I enjoyed the fact that there was influence access from grass roots to service providers and local government decisions. There was an opportunity to improve local service delivery through resident involvement and comments and when small amounts of money became available, ideas/plans made through Planning for Real, Participatory appraisal and Street surgeries could be further developed e.g. new street lighting to provide safe streets; play equipment; dog warden patrols. It is often the day to day issues that affect individuals and communities like traffic speed, being able to eat, feel safe etc, so the influencing, co-ordination of local services was important and effective in these projects. Unfortunately, government cuts mean that risk taking, innovative work like the above has ceased. It is often the small investment in community development and engagement that can make a difference in communities. Communities can address their problems and their assets and work with other agencies to address them. It has been proven, even in my work, through reports, evaluations, feedback, positive impact of service changes and so on. There are so many more stories and reflections about this work, but I am running out of space for the website page! I left East Riding of Yorkshire Council, again when funding was pprecarious,to go part time in my last working years to combine Community Development with my Christian faith. So, I was fortunate to be taken on by SEARCH, co-working with Cathy Westby. That was a fabulous working partnership. We made a good team! 2012- 2016 – SEARCH (Social and Economic Action Resource of Churches). There is also much to be said here and stories to tell but I am running out of time and space……. Supporting churches with their social and community action was very rewarding personally. It was also good and effective to work in partnership with the City Council and other organisations and agencies e.g. anti-poverty work. Unfortunately, as the years went by, more funding cuts meant that less staff in statutory and voluntary organisation situations were able to continue in this work. Redundancies also took their toll. As the Government cut grants and funding to the statutory, voluntary and community sector, services/work were apparently carried out on a shoe string. VCS infrastructure was declining. It was all being done on as a ‘you pay us’ mainly for courses, help and advice. The very support needed to strengthen communities in these years of austerity were being withdrawn. Individuals and communities increasingly left to fend for themselves. Fortunately at SEARCH we had money from the Church Urban Fund(but didn’t join their federal structure) and eventually Rank Foundation. We were also fortunate in getting two paid interns two years running form them. We worked on anti-poverty plus did information/training with churches on welfare benefits, had discussions on working tougher/addressing issues in communities and started the Living Better for Less in Hull scheme funded by the Rank Foundation This emerged from work we had started in supporting those churches providing a debt management service. Plus, the rise in Foodbanks was alarming . The Biblical principles of learning to work with your hands was at play as well as helping people budget, learn how to live on less, grow, bake food and gain skills and confidence. At this time. Andy Paxton and Adrian Fisher were the inspirational and practical people helping churches and their communities set up gardens in waste spaces; either at the back of churches or organisational buildings or in open spaces or resident gardens. This was so successful. To date many of the sites still operate with the help of Martin King and there is growing, enjoyment of open spaces and cooking going on. I wrote an evaluation piece about this describing how much more than numbers helped this scheme was. People felt cared for, they came together to do things, share meals, cook etc. it gave them confidence, skills and ways of coping with life supported by local churches and organisations such as HYFC - Hull Youth For Christ (Amazing organisation)! So, we learnt, as I did, that we need to work with people through activities that effect their day to day lives such as growing, cooking, doing art/creative activities, sport etc. That linking into being able to gain confidence, to have a better quality of life, to influence /have a voice is crucial. Andy Dorton, Dave Rogers, Liz Shepherd have been a part of my Community development journey for a long time. Especially Andy and Dave Rogers. Thank You. For the privilege. The last day of my last week working, before retiring, My mother who had been ill for several years died….. There are many more stories of people I could tell, of them developing their communities, influencing decision making, working together, gaining confidence, gaining a voice to act for themselves and their communities. There are stories of risk taking, courage and bravery as people stood up for what is right and just. There are stories of sadness, of joy as successes came and went. There is diversity, humour, passion, including people from the margins, art, sports , training, economics, environment and so on and so forth..